M. Aurelius M.f. 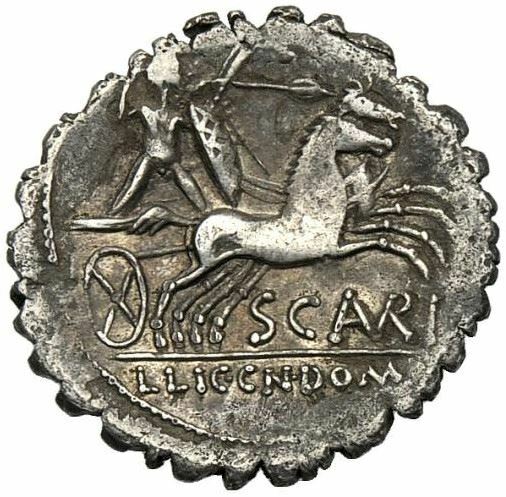 Scaurus was one of the moneyers for the year 118 BC. He struck a joint issue with his colleagues for the year, L. Licinius Crassus and Cn. Domitius Ahenobarbus, and may have served as Quaestor at a later date, but is otherwise unknown. Gens Aurelia was a plebeian family at Rome, which flourished from the third century BC to the latest period of the Empire. The first of the Aurelian gens to obtained the consulship was Gaius Aurelius Cotta in 252 BC. From then to the end of the Republic, the Aurelii supplied many distinguished statesmen, before entering a period of relative obscurity under the early emperors. The Aurelii Scauri were a relatively small family, which flourished during the last two centuries of the Republic. Their surname, Scaurus, belongs to a common class of cognomina derived from an individual's physical features, and referred to someone with swollen ankles.